After an hour-long delay the next day, the team makes vehicle improvements. 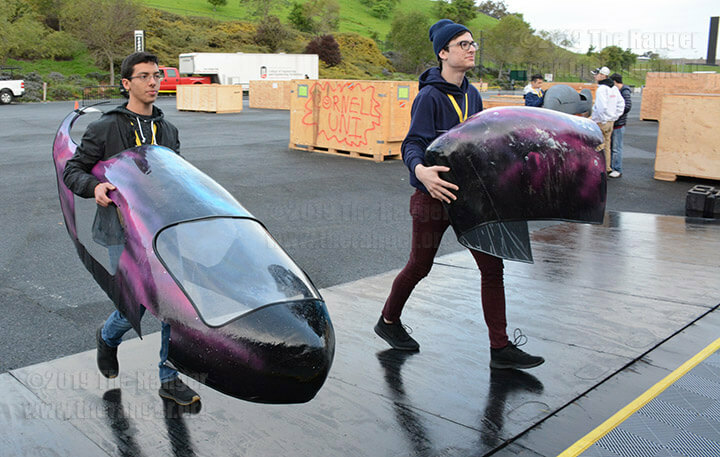 SONOMA, Calif. — The Motorsport team unloaded and began working on their hydrogen fuel-cell prototype vehicle, Odyssey, at 7:30 a.m. Pacific Standard Time April 3 after a 4 a.m. PST start to their morning for the Shell Eco-marathon Americas competition at Sonoma Raceway . 76 of the 88 teams have registered and are currently at the raceway. Team registration will remain open the rest of today and halfway into April 4. Some teams had the opportunity to make adjustments or major modifications to their vehicles until 10:30 p.m. PST April 2. The Motorsport team did not receive this additional time because they were not permitted to unload their vehicle at the paddocks when they arrived at 5:40 p.m. PST April 2. Any team that did not unload their vehicle before that time could not unload or work on their vehicle, including the Motorsport team who remained in registration and a mandatory safety course until 7 p.m. PST. The team was under the impression the cutoff time for the paddocks was 7 p.m. PST, however that cutoff time only applied to the raceway safety course, which consisted of a video and a presentation by Andy Fink, health safety environmental specialist for Shell. The short class informed participants on the raceway’s safety rules, including the requirement of seatbelts while driving and other safety precautions. Mechanical engineering sophomore Isaac Medina asked Fink if team members could tuck in their ID badge while they worked on the vehicle if it gets in the way. Other teams who completed registration and the raceway safety course before 5 p.m. PST gained, at least, 5.5 hours of potential time to improve their vehicle over the Motorsport team because the paddocks closed at 10:30 p.m. PST. 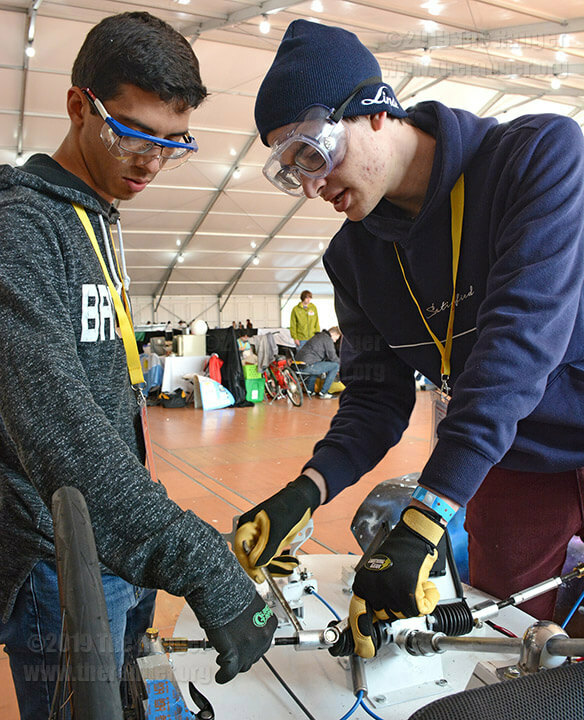 The paddocks is a tent-like structure that houses all of the teams and provides them a space to work on their vehicles before the competition. 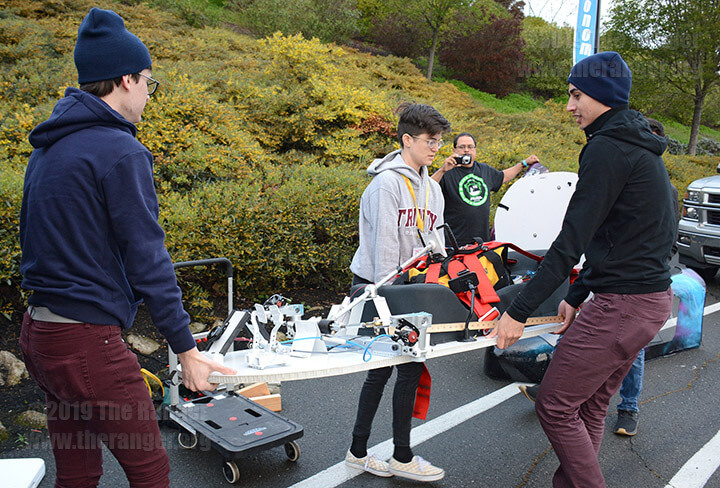 Although the team was not penalized for missing the first day’s cut off, they lost valuable time to work on their vehicle. They needed to test the vehicle’s motor controller and mount the door threshold and outer shell, all of which had to wait until the next day. A Shell official told the team they would be allowed to unload their vehicle at 6 a.m. PST today. Upon arrival to the raceway before 6 a.m. PST, the team was told they could not unload Odyssey until 7:30 a.m. PST. The team is currently working on their vehicle, and plans to finish it before today’s inspections end at 6 p.m. PST according to electrical engineering sophomore Allie Moore. Inspections continue until 7 p.m. PST April 4. Of the 10 team members, four arrived April 2, two more will arrive today and come straight to the raceway to help modify the vehicle, four and an adviser will arrive late in the evening, and two advisers will arrive April 4. The Ranger will continue coverage of the competition throughout the week.